Elis Springback Tee Field Attachment | American Made.Handmade.Built Strong. Introducing the new Springback Tee Portable Field Attachment. 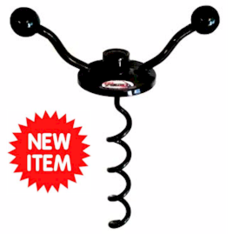 This new, exciting device has been created to make it easy to transport your Springback Tee(s). The normal Springback Tee base weighs roughly 10 pounds and is great for indoor as well as outdoor use. However, the new Portable Field Attachment allows you to have even more light weight outdoor portability, weighing only one pound. Simply leave the original Springback Tee base at your facility or at home when going outdoors for tee work, instead take your Portable Field Attachment with your stem(s), which makes it easier and lighter to carry in your baseball or equipment bag. How to use: Find a good ground to do tee work. Push the tip of the Portable Field Attachment into the ground to start the ground attachment. Push down and turn until base is tight against the ground and attachment is locked into the ground. Then screw your stem into the Portable Field Attachment. Now throw up your net and start hitting!